Why did Arbuthnot charge the German line? HMS Defence, the flagship of Rear Admiral Sir Robert Arbuthnot was one of the terrible casualties of Jutland. Arbuthnot had seen the engagement between with Wiesbaden and some of Horace Hood’s ships. Some say he wanted to intervene and prevent the Wiesbaden escaping, others that he was deploying his squadron to take it round to the back of the line. He still passed dangerously close to Vice Admiral Sir David Beatty’s flagship missing her by around 200 yards. 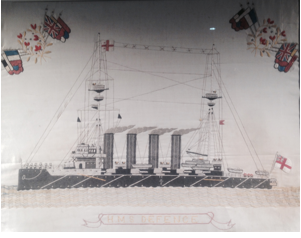 Of his four ships, only two managed to cut across – his own, HMS Defence, and HMS Warrior. The Duke of Edinburgh and HMS Black Prince didn’t. The two ran into a hail of fire and Defence was seen to explode in front of the passing ships of the Grand Fleet. Warrior got away. Arbuthnot was taking his ships to the rear of the line to take up a new position rear of the dreadnoughts. He should have passed behind the Grand Fleet. Instead, he passed in front, not only obscuring British fire but also, because he attacked the Wiesbaden, attracting fire from a number of powerful German ships. 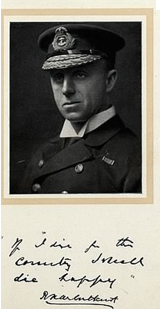 Jellicoe had wanted to remove him from command a few years earlier but had been refused by the admiralty. Arbuthnot was disliked by his men for excessive discipline. Rear Admiral Sir Robert Arbuthnot’s prophetic words. She was an old armoured cruiser and as such should probably never have been part of the British battle line. She wasn’t built for such a role. Rather her role was conceived of as being an armed ship that could interdict an adversary’s merchant shipping at sea. One of the terrible flaws in the design of Defence was the midships between the main fore and aft 9.2inch Mk XI guns. Here were ten secondary guns, all BL 7.5 inch Mk V, five on each wing, supplied with shell and cordite from the main magazines where strict magazine handling practices were probably upheld but where, beside each gun, great bins, capable of holding between 40-60 cordite bags, were built. In April 2015, on the North Sea Expedition organized by Gert Normann Andersen of the new Sea War Museum in Thyborøn, Denmark, Dr. Innes McCartney and I were allowed a privileged view of her wreck using the powerful multi beam sonar scans of the M/S Vina, one of the pipe-laying ships from Andersen’s JD-Contractor A/S company fleet. McCartney has spent more than fifteen years diving the wrecks of Jutland and wrote about the archeology of the Defence. My memory of the day is very different from what his would have been. Arbuthnot had been ashore two days before Jutland and had been playing tennis with my grandmother, Gwen Jellicoe, the Admiral’s wife. A small village link between Jellicoe and a Royal Marine on HMS Defence. George Henry Buckle was a Royal marine artillery Bombardier on HMS Defence. He came from a small village between Eton and Windsor called Clewer, where he met his wife. She had been born and bred in Pennington near Lymington on the edge of the new forest in Hampshire. They met when Andrew Wright’s great grandmother was employed by the local vicar as a house keeper, a job she applied for whilst living in Pennington. They married and lived in Southsea Portsmouth, next to Eastney barracks at 80 Cromwell Road, Andrew is still researching in which turret his great grandfather was in when he died. The link is that one of John Jellicoe’s ancestors had lived in Clewar. In what was then the manor house. More work to be done on this! Dr. Innes McCartney. 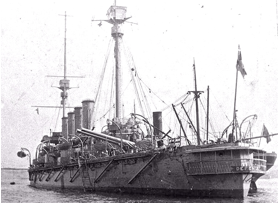 The Armoured Cruiser Defence: A Case Study in assessing the Royal Navy shipwrecks and the Battle of Jutland, 1916, as an archeological resource.